In an ever-more connected world, managing digital assets after a death is becoming an increasingly important step in planning our final arrangements and those of our loved ones. After a loved one has passed, they may have digital assets that continue to live beyond them – such as various social media profiles, online bank accounts, online data storage accounts, email accounts, and more. It’s important to determine how to manage these items after they’re gone. This document provides detailed information about managing a variety of online accounts and the data stored within upon death. Learn how to pre-arrange for the management of your social media profiles (such as Facebook, Twitter, LinkedIn, etc. ), online bank accounts, online data storage accounts, email accounts, and more. 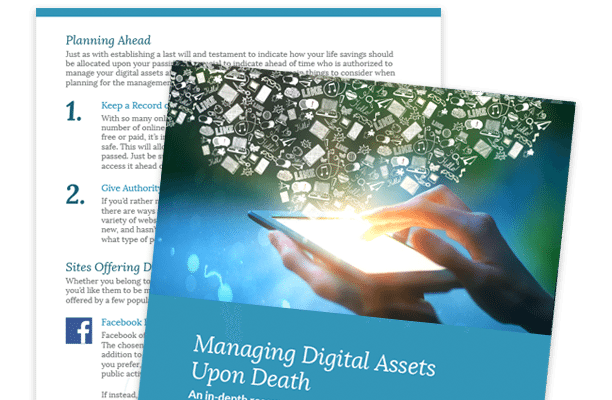 If you have questions about managing the digital assets of a loved one, or about how your digital assets will be managed after you’re gone, download our free guide: Managing Digital Assets Upon Death: An in-depth resource for setting up access and management protocols for your digital assets after you’re gone.